ship berths as free of residual oil deposits for upcoming dredge projects. ‘pom-poms’ and the procedure is repeated until no oil is detected. beam and necessary components for lifting and dragging operations. weather prevent commencement in which case, specific permission must be obtained from NJDEP. 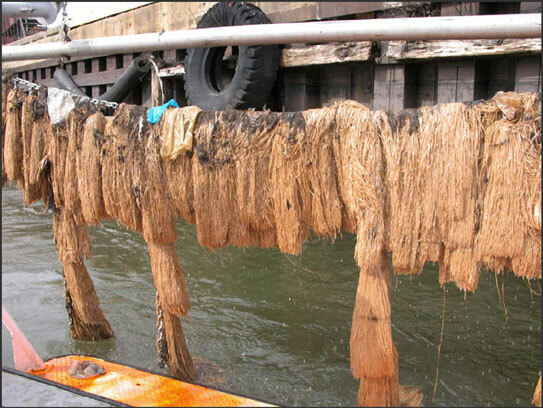 • Prior to dredging, a dragging of sorbent material atop sediments to detect residual oil deposits from the November, 2004 oil spill. • A towing vessel dragging a weighted mopping beam aligned perpendicular to the direction of travel. accurate to +/- 1 meter. • Sorbent pom-poms in sufficient number, attached to the mopping beam to ensure continuous coverage along the mopping beam. • The dragging vessel shall proceed at no more than five (5) knots. attempt to make contact with all areas to be dredged. 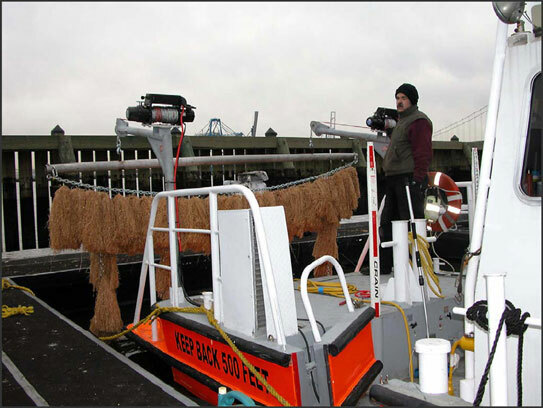 • The mopping beam transects should extend so mopping occurs at least 25’ outside of the area to be dredged, if accessible. 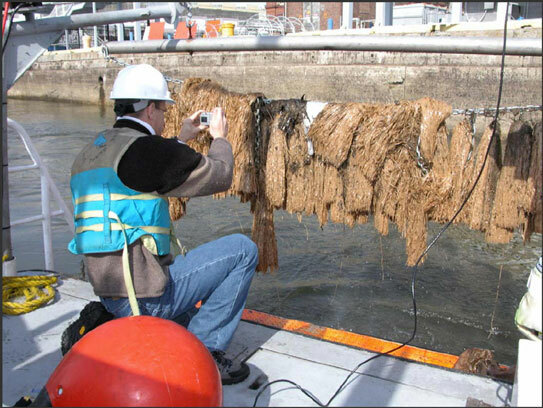 • After each pass, the mopping beam shall be completely removed from the water and inspected. encountered, shall be noted for inclusion in the Field Report. • Photos will be taken when oil is present and/or before the pom-poms are discarded. been removed or if additional oil is present. • Berth name and date(s) of dragging operations. • Time of each transect run and an index number assigned to each transect run. • Description of the condition of the pom-poms correlated with each transect run. • Photos of pom-poms will be included in Report and correlated to respective transect run. • An AutoCAD drawing (or equivalent) of the berthing area including major features (piers, bulkheads). positioning system, including the corresponding depth. Transects indexed as referenced in the Field Report. 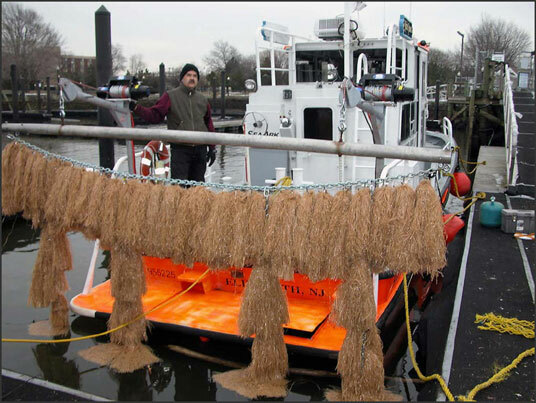 • Field Report Submitted to NJDEP Office of Dredging and Sediment Technology. 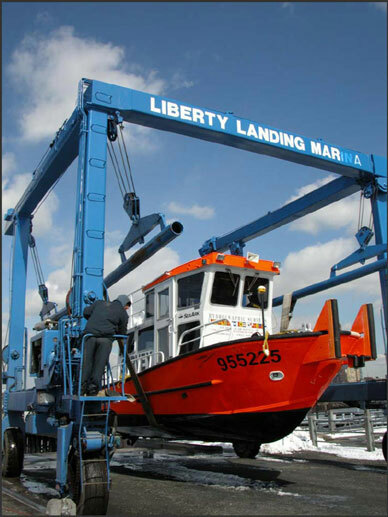 Completing installation of winches and lifting tackle at Riverside Marina, Gloucester, NJ. Completed rigging and dragging bar, with viscous snare material attached. Explaining methods and procedures to representatives of Philadelphia Regional Port Authority. Condition of viscous snare material being documented after each pass. 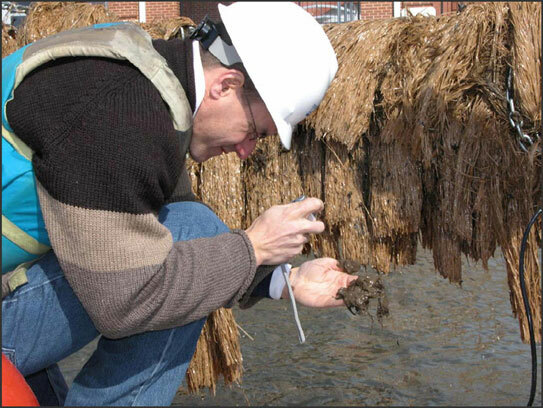 Sonny Rutkowski, Weston Solutions, examines and photographs sediment from mopping. Typical Sediment and Debris, no oil present. Copyright © 2005 Hydrographic Surveys.